Saturn Might Have A New Baby Moon Named Peggy : The Two-Way The Cassini spacecraft spotted a disturbance in the sixth planet's outermost main ring that is thought to be caused by a tiny moon. It's not like Saturn needs another moon to look after — it's already got 53 officially, with nine more labeled as "provisional" (and those are just the ones we know about). But the tiny, icy object nicknamed "Peggy" could prove hard to resist. NASA's Cassini spacecraft spotted evidence of Peggy, which is believed to measure just a half-mile across, as its slight gravity was disturbing the edge of Saturn's ring system. The find is reported in the journal Icarus. "We have not seen anything like this before," astronomer Carl Murray, the lead author, said in a statement. "We may be looking at the act of birth, where this object is leaving the rings and heading off to be a moon in its own right," says Murray, who named the moon — at least temporarily — after his mother-in-law. (It was her 80th birthday when he made the discovery). "The fuzzy blob on the A ring's edge was imaged by Cassini's narrow-angle camera exactly one year ago, on April 15, 2013. "Peggy, which is believed to have caused this mess, is too small for Cassini to see directly. 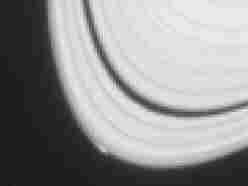 But NASA scientists hope to get a closer look in late 2016, when Cassini is scheduled to fly near the A ring." Murray says: "The theory holds that Saturn long ago had a much more massive ring system capable of giving birth to larger moons." "As the moons formed near the edge, they depleted the rings and evolved, so the ones that formed earliest are the largest and the farthest out," he says. "Eventually Peggy may coalesce into a slightly larger moon and move outward, establishing its own orbital path around Saturn. This is how many of Saturn's other moons are thought to have formed much further back in the planet's history. Now, its rings, having been depleted of moon-stuff, can only create tiny objects like Peggy." "The object is not expected to grow any larger, and may even be falling apart. But the process of its formation and outward movement aids in our understanding of how Saturn's icy moons, including the cloud-wrapped Titan and ocean-holding Enceladus, may have formed in more massive rings long ago. It also provides insight into how Earth and other planets in our solar system may have formed and migrated away from our star, the sun."